Well, it wasn’t really THE Apocalypse, but, after a week without heat or electricity or phone, and with temps in the house falling to about 45 degrees at night, it sure felt like it could be. 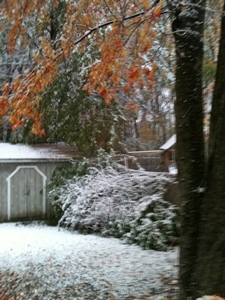 The snow started a week ago a few days before Halloween, and it looked like this. We lost half of the ancient maple tree, the leaves of which were just beginning to turn, and it probably will have to be taken down completely. We lost pieces of the maple in our front yard as well and portions of various trees that form the edge of the property that borders on conservation land. Two days ago, my daughter went out and bought a chain saw. With a gas stove and gas-heated hot water, at least we were able to eat and wash the dishes during the icy winter week. Our unheated but enclosed porch became our refrigerator as we tried to save as much food as we could. 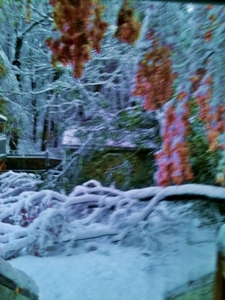 By the time that the snow finally stopped, power, phone, and cable lines were loosed or down all along our street (and all over this part of Massachusetts). The storm’s strength took out the power so quickly that we didn’t have a chance to charge our cell phones and laptops. We husbanded our battery flashlights and the meager amount of dry firewood that we had available. We all hunkered down in the living room, blockading its doorways with blankets. 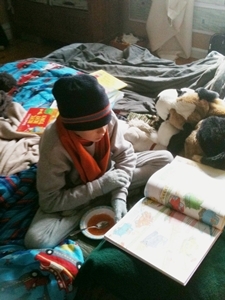 This is my grandson, trying to keep warm on the mattresses and quilts piled on the living room floor. Lines began to form at the gas stations until finally there was no gasoline left within an hour’s drive of our town. I had about a quarter tank of gas in my car and eventually went out to charge my Iphone. Thankfully, my daughter and son-in-law had the foresight to move our cars far enough onto the property to avoid any limbs that might fall from our neighbor’s rotting oak. One limb did fall — right where our cars would have been. It settled itself over all three power lines that run above our driveway (cable, phone, electricity), blocking our ability to back out when the storm stopped. Eventually, a very helpful neighbor with a chain saw cut off enough of the branches so that the cars could get out; but the limb remained, threatening to take down the lines completely. The property taxes in this town are pretty high, but the upside of that is that the town set up an emergency shelter in one of the schools, with cots lining the gym and three free meals a day for anyone whose homes were without power. They distributed water bottles, showed movies in the afternoons, and lined the main hallways with chairs and surge protectors so people could charge their phones and laptops. Eventually they even had wifi. They were staffed with volunteers that paid special attention to all of the elders who flocked there for the only support they had available. We were finally able to get gas, and then the two main grocery stores opened with generator power. There was nothing available that had to be refrigerated, but we were able to pick up soups and breads and, of course, lots of Puffs tissues. We got our power back yesterday, exactly (almost to the hour) a week from when the storm began. The tree limbs are off the wires, but we still have no landline phone service. Having been sleeping in a 45 degree bedroom, dressed in multiple layers — including a hat — and burrowed under two blankets and a quilt, I now am close to understanding what the homeless must suffer in cold weather. What I wished I had available were old fashioned rubber hot water bottles for my feet and hands and a book light that used regular batteries. I have ordered these in preparation for what I’m sure will be coming down the pike this winter. We also will be buying some kind of generator so that we can keep the house at a livable temperature should we find ourselves, again, faced with this kind of winter misadventure. But we survived. My grandson is recuperating from an terrible sore throat virus, and my daughter is exhausted from taking care of him, tending the fire, and feeding us all. Hestia lives in her. Me? I was just too cold to be of much help. This entry was posted in aging, catastrophes, family, food, technology by Elaine. Bookmark the permalink. Good grief Elaine – I’m glad you all pulled through no worse for wear. Do put in a good supply of firewood as well – generators do break down/run out of gas.